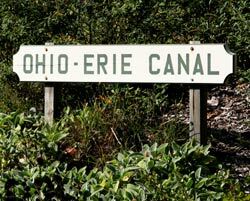 Ohio was only 21 years old when the legislature authorized funding for an Ohio Canal. This was not a spur of the moment decision. A commission had already conducted a study to see if it was even possible for a canal to cross the state. The principal goals of the canal was to serve as many voters as possible, connect the Ohio River with Lake Erie, do it as quickly and cheaply as possible, all without throwing the state into bankruptcy. No small task. Before the arrival of the first canal, the only way farmers, manufacturers, and travelers had for getting anywhere were poorly constructed roads that were often impassible during the winter and wet spring months. The much anticipating National Road had only reached Wheeling by 1817 and it would be another 16 years before reaching Columbus. By 1820, 580,000 residents were estimated to be living in the state, with most of them involved in agriculture. The problem with modern agriculture of the day was that they had more produce than they could use and no way to move it beyond their local community. Moving the excess produce beyond the local, and into the cities required some means of transport that was at least a little bit reliable that wouldn't eat up all the profits. For Ohioans in the early 1800s that solution seemed to be an expensive, somewhat slow moving canal system that could connect with the two major bodies of water around Ohio: Lake Erie that connected farmers with the east coast, and the Ohio River that connected to the Gulf of Mexico. Several years before the Ohio legislature seriously considered a canal system, in New York state, work had begun on building a canal connecting Lake Erie with the Hudson River and ultimately New York City. That work seemed to be progressing somewhat smoothly and with its completion, it would open lots of possibilities for Ohio's farmers and businessmen to sell goods to a much larger market. Canal engineers located decided on a route this new transportation system would take. The fastest and most direct route between two points was not as high on their list as was providing a dependable means of transportation, to as many Ohioans as possible. Some politicians even went as far as suggesting the most advantageous route would take a diagonal cut from the northeast to the southwest. Such a canal would pass through or near the major population centers. However desirable this route may have appeared to the politicians, it did not satisfy the engineers. This diagonal path cut the state's watershed in such a manner that it would have been impossible to keep the canal filled with water. A compromise was struck resulting in two main canals being built, one in the east and one in the west, with numerous smaller canals feeding it. They would be called the Ohio & Erie Canal, and the Miami and Erie Canal which were so designated because of the main rivers that connected with the lake. In 1855 the dual canal system in Ohio reached its high water mark as far as revenues were concerned. The Ohio canal system had grown to almost 1000 miles. With so many miles of big, water-filled ditches to maintain, it was reaching a critical point where the costs were beginning to outweigh the benefits. It was just about this same time that some new technology was being developed. The invention of the fired steam engine that could power a machine on narrow ribbons of iron, began to become a feasible alternative to the once relatively high-speed 5 mph canal boats. Railroads could transport goods across the country, without regards to a water system. The narrow ribbons of iron could be laid almost anywhere, could cross over canyons go uphill, things that could never be considered with the canals. Today less than 20% of the original canal system is still owned by the state and this is spread throughout the state in small plots of less than an acre. However, recent interest in the historic canals has attracted the attention of small Ohio communities to use what remains of the canals as attractions. A number of communities have preserved sections of the old canals that provide visitors with glimpses of a bygone era in Ohio's history. Even though the canal systems in the United States have long been discontinued, large sections of the Ohio-Erie Canal System are today important recreational bonanzas for local communities participating in the restoration of the tow-path trails. One such success is the Ohio & Erie Canal way and the Ohio & Erie Towpath Trail. The Ohio & Erie Canal way is a National Heritage Area: a place to experience trails, trains and scenic byways, canal towns and ethnic neighborhoods, working rivers and great lakes, industrial landscapes and green spaces. Stretching from downtown Cleveland to the Tuscarawas River Valley, the Canal way extends through Cuyahoga, Summit, Stark and Tuscarawas counties. The towpath followed along one side of the canal to provide a path for mules to pull a canal boat along the route. These were handled by young boys who would either ride one of the mules or walk along side. They would be paid about $20 a month. Today, many of these trails have been converted in paths used by hikers and bikers that can move along the canal. One of these trails is the Ohio & Erie Towpath Trail. This multi-purpose trail was developed by the National Park Service and is the major trail through Cuyahoga Valley National Park. From it you can make connections to many of the natural and historic sites in the park and to other trails that intersect it along the way.